Verona was famous in roman times and then a second time when the members of the prominent Della Scala family ruled the city in the XIIIth and XIVth centuries. They ended up controlling most of northern Italy and built impressive palaces, churches and military buildings in many of the cities and villages they controlled. The greatest figure of all was Cangrande, a brave soldier, an excellent politician and also a benefactor of artists and poets. Welcome to the age of rival cities, of power plays between Pope and Holy Roman Empire. Our tour starts with a short bus ride so that we can follow the city walls which were built by the Scaligeri family members. In the XIVth century Verona was considered one of the ‘big’ European cities,and this means there were many square kilometers of land within the walls, enough fields for the economy to thrive and a safe haven for the citizens. 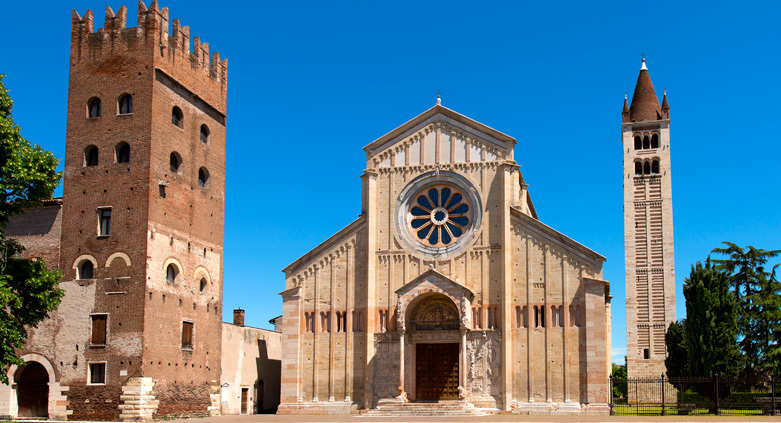 We will drive past the Basilica of San Zeno, one of the most beautiful Romanesque churches of northern Italy and part of a Benedictine Abbey which already at the time of the Carolingian rulers was used as seat for the ‘imperial Diets’ during the conflict between the Holy Roman Empire and the Papacy. Beyond a bend of the river the ‘Castelvecchio’ castle appears: it is a fortified residence and one of the symbols of the Middle Ages together with its crenellated bridge and keep. It is the perfect representation of a castle from the Middle Ages and you can easily imagine a princess in distress looking out of one of the windows… and a fierce dragon not far away. As we follow the river Adige imagine it in the past: it was navigable and the shores were dotted by mills and boats tied to the piers.All of this disappeared in the XIXth century and all we see today are the bell towers of numerous churches, many of them built with the typical brick and tuff stripes of the XIIth and XIIIth century. We start our walking tour crossing Ponte Nuovo and reach the small square with the statue of Garibaldi, the only reminder of a huge private garden adjoining the palaces of Cansignorio and Cangrande. The two impressive brick buildings need to be observed with great attention in order to recognize the changes from a simple tower-house to a fortified residential palace, the interior of which was richly decorated with frescoes, marble columns and elaborate ceilings whereas the outside was a simple square building with four corner towers. 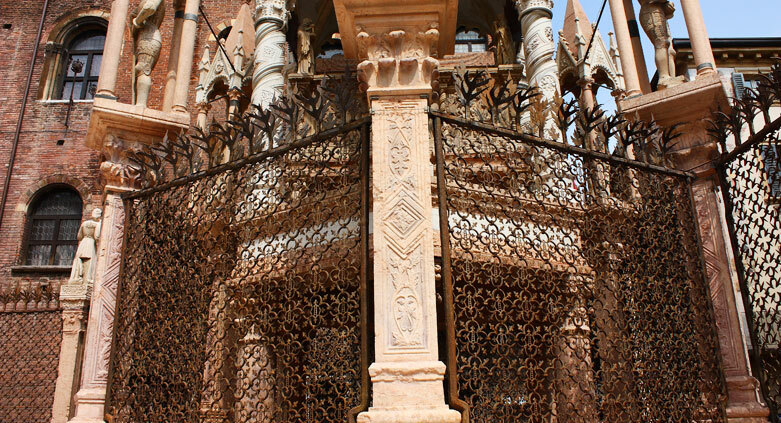 Romeo’s house is similar in shape if not in size and reminds us of the fighting between Guelphs and the Ghibellines, supporting respectively the Pope and the Emperor as Dante mentioned in the Divine Comedy and Shakespeare immortalized in his play ‘Romeo and Juliet’. The poet lived at the court of Bartolomeo at the beginning of his exile from Florence and came to know the young Cangrande, a brave and fearless knight, his future benefactor: to him Dante will dedicate the third part of the Divine Comedy written partially during his second stay in Verona. The narrow alley linking Piazza Signori to Piazza Erbe is where Mastino Ist was killed and his murder was one of the reasons why Alberto, brother of the slain Mastino, transformed the city-state in to a princely state in 1277. The market will surprise you with colours, sounds and smells which are more or less the same today as in the XIVth century. 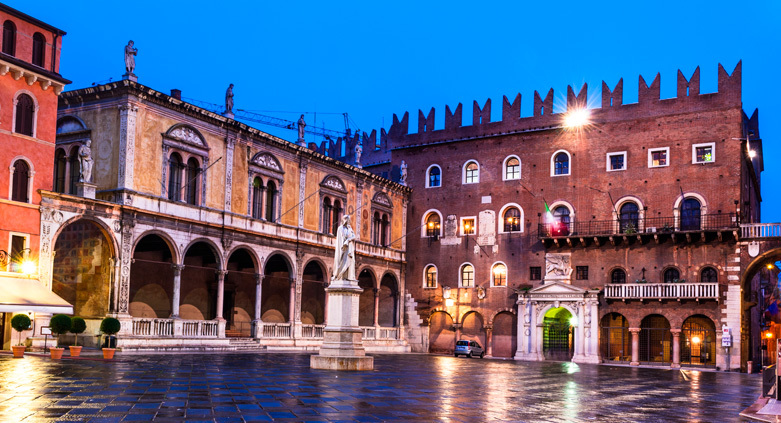 After having paid our dues to eternal love by visiting the courtyard of Juliet’s house we reach Piazza Brà and the Arena which in the Middle Ages was the stage for a variety of bloody events. The tour ends on the bridge of Castelvecchio, where you can think back to all the legendary and historical figures we have encountered along the way. MEANS OF TRANSPORTATION: the bus or car of the clients is necessary for this tour. The first part of the tour is by bus, after about 20 minutes we start our walking tour which ends in Piazza Brà. *Some parts of our tour have uneven surfaces and there are few steps along the way. No entrance fee is foreseen. THIS TOUR IS AVAILABLE IN: Italian, English, German, French, Spanish, Russian, Rumanian, Portuguese, Finnish, Turkish and Japanese. Ask for the language you are interested in. TO COMPLETE YOUR DAY: Basilica of S. Fermo, S. Anastasia, Castelvecchio. FOR WHOEVER HAS AN EXTRA DAY: Lake Garda, Soave, Valpolicella, the Rice Road Tour. ASSOGUIDE is not responsible for changes in the opening hours of the various monuments.